After flying John Nys's RV10 in the hot Oklahoma summertime, it was determined that an air conditioned RV10 was a must. I was at Oshkosh in 2005 looking for an air conditioning system for the RV10. Since I had installed air conditioning in my street rod, I thought I could come up with a system that would work on my own. 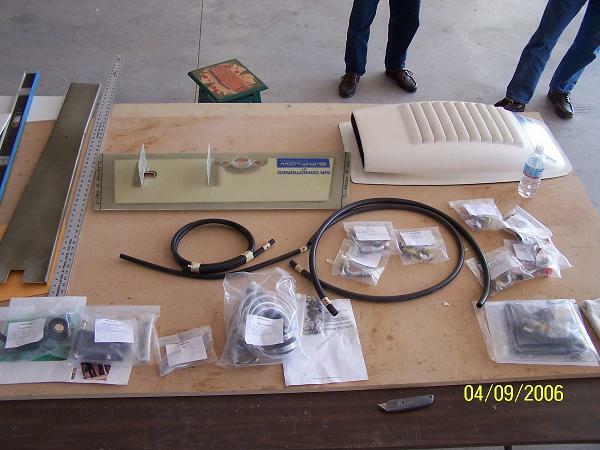 There were several vendors that sold electric air conditioning systems. At first this seemed to be the way to go. The following findings were reasons NOT to install the electric air conditioning system. 1. The entire system would have to be installed in the tail of the airplane. 2. A 24 volt system would have to be used to power the air conditioning. 3. An alternator that could supply enough power at idle to power the air conditioning would cost $2000.00. 4. The weight of the complete system would weigh around 65 pounds. 5. The price of the system would be $8500 not including the alternator. One day we were over in the Lancair area and saw two Lancair IV aircraft with a P51 belly scoop on them. When we went over to check out the scoop, we found out this was the condenser of an air conditioning system. Airflow Systems was the manufacturer of the system. There was no one around to answer our questions, so when I got home I looked the company up on the web. The only system they had available was for the Lancair aircraft. I e-mailed the company asking about a possible system for the RV10. While I was waiting for a reply, I decided to flip the fiberglass top over on my work table and come up with a fiberglass ceiling duct that would supply air to the cabin. A side benefit of the overhead duct was it completely covered up the door hinge mounting hardware and the four depressions in the cabin ceiling. I got a reply from the Managing Director Bill Genevro and it just so happened that they were working on a system for the RV10. Bill was coming to John Nys's Tulsa workshop to install a preliminary system on Alex DeDominicis's RV10 and to see my duct. At first I wanted to keep the duct for myself to have a custom look, but after talking to Bill I decided to sell the duct to him. They are still tweaking the installation, but the output air temperature thru the evaporator was 35F degrees with lots of airflow. The airflow system uses an engine driven compressor. A custom compressor mount with idler pulley is mounted on the left front side of the engine. Most IO-540 engines have a mounting pad in this location. A builder supplied starter-flywheel with dual pulley grooves is required . The evaporator is installed on a custom shelf in the tail just behind the baggage area. The intake air for the evaporator is provided thru a plate in the aft baggage bulkhead cover into the cabin. The condenser is mounted on the bottom of the aircraft in a P51 style scoop. The total weight of the system is 45 pounds. As you can tell, the system is placed on the aircraft to minimize cg changes. Preliminary calculations of the arm and weights of the three systems and then adding them to the basic RV10 weight and balance, the c.g. moved aft 3/8". The kit comes with everything you need to install the system in your aircraft except for a few miscellaneous hose clamps and the dual pulley starter-flywheel. Also included, but not shown, is the overhead duct assembly with air vents, evaporator and air supply hose, and the receiver/dryer. The duct assembly side benefit is it covers the 4 hinge depressions in the ceiling of the fiberglass top. The installation shown follows Airflow Systems recommendations. A few custom modifications are noted where applicable. AirFlow Systems is setting up a network of approved installers of the RV10 air conditioning system in new or retrofitting existing aircraft.